Fifty years ago this month, First Lady Jacqueline Kennedy traveled to India and Pakistan. Although the trip was not an official State visit, Mrs. Kennedy attended various functions as an official representative of her husband, President Kennedy. Our new media gallery, which draws together museum artifacts, audiovisual assets, and textual documents from across the Library and Museum, offers online viewers a fuller sense of Mrs. Kennedy’s fourteen-day trip to that region. As curator of the media gallery, I collaborated with my associates in other departments to develop a representative, cohesive, and visually vibrant display. I also culled relevant textual documents from our digital collections. 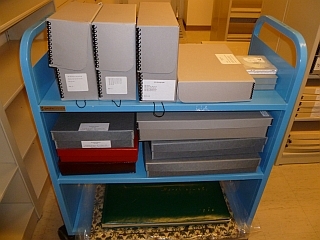 Viewers who look at the media gallery and see only a photograph collection will discover that behind each visual image lies the expert knowledge of an audiovisual archivist, museum specialist, processing archivist, and metadata cataloger. The first step in the curatorial process was to select images from the White House Photographs collection that were visually pleasing and highlighted events from Mrs. Kennedy’s trip. Since every good archivist knows that items must be properly identified to be accessible, my second step was to transfer the photographs to metadata cataloger Lindsay Closterman, an expert in the cataloging of the White House Photographs. In order to decipher the who, what, and where of these images, Lindsay consulted many sources including shot cards, other materials in the audiovisual archives, Mrs. Kennedy’s travel schedules, and modern online images of some locations for comparison. 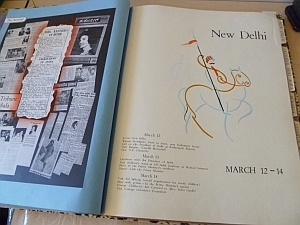 Another helpful resource was the large photo album given to Mrs. Kennedy by the Indian government as a memento of her trip. The album outlined dates and locations and identified individuals by name. Using Mrs. Kennedy’s outfits as a guide, Lindsay was able to verify event dates and locations in the White House Photographs. Newspaper articles from March 1962 also helped her to confirm important factual information. Its dazzling color and sheen were calculated to ensure that she would be instantly identifiable to the crowds on the distant shore as they watched her barge on its way to the maharana of Udaipur’s White Palace, where she was feted that evening. Connecting the clothing artifact with images of Mrs. Kennedy wearing the dress not only gives the viewer an appreciation for Mrs. Kennedy’s appearance, it also affirms her intelligent perception of how others would encounter her during her travels. Having gathered photos, museum artifacts, and textual documents and making certain that all items contained appropriate metadata and links to associated records, the final step was to organize the gallery, which proved to be a bit like solving a Rubik’s Cube. Not only did I want the layout to look well-balanced and eye-catching, I also wanted to situate related items close to one another to underscore their connections and to make the viewer’s experience richer. By exploring the media gallery, viewers can make connections of their own. For example, did you notice that Mrs. Kennedy is wearing the ceremonial welcome necklace in the arrival photo? Or that she has on the pale yellow dress when going for an elephant ride? Incorporating a wide variety of media into the online gallery was a collaborative, cross-departmental effort that resulted in a rich display of the archives/museum holdings—one that hopefully offers to both casual observers and serious researchers alike a deeper understanding of the collections at the John F. Kennedy Presidential Library and Museum. Loved your entry, so informative. I look forward to more behind the scenes details. wonderful information in the blog and the online exhibit was beautiful. congrats! Great read! Wonderful exhibit and so nice to have an inside peek on the creation of the media gallery. Really enjoyed learning about the process as well as the exhibit. The online presentation was elegantly prepared. Reading the who, what and how of the research was brilliant.